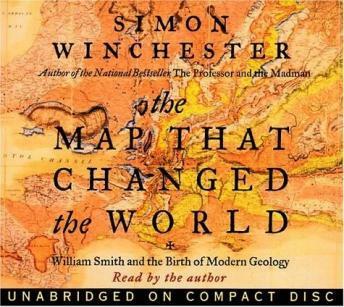 Listen to "Map That Changed the World CD : William Smith and the Birth of Modern Geology" on your iOS and Android device. In 1793, William Smith, the orphan son of a village blacksmith, made a startling discovery that was to turn the science of geology on its head. While surveying the route for a canal near Bath, he noticed that the fossils found in one layer of the rocks he was excavating were very different from those found in another. And out of that realization came an epiphany: that by following these fossils one could trace layers of rocks as they dipped, rose and fell -- clear across England and clear across the world. Obsessed with creating a map that would showcase his discovery, Smith spent the next twenty years traveling England alone, studying rock outcroppings and gathering information. In 1815 he published a hand-painted map more than eight feet tall and six feet wide. But four years later, swindled out of his profits, Smith ended up in debtors' prison. His wife went mad. He lived as a homeless man for ten long years. Eventually a kindly aristocrat discovered him; Smith, the quiet genius and 'father of geology' was brought back to London and showered with the honors that he rightly deserved. Here now is his astounding story. This is a very interesting book. It makes you feel part of history being made. A good read. I agree with the other reviewers who felt the book simply never became exciting. I loved "Professor and the Madmen" and "Crack at the Edge of the World." However, I couldn't hang in with this one. I enjoy reading and learning about history but you have to already have some interest or knoweldge about geology already for this one. I was hoping that this book would get me excited, or at least interested, in that topic, after getting a taste from "Crack at the Edge" but it just didn't happen. Thopugh I found it dry other with a stronger interest than mine would probably really enjoy it. WELL WRITTEN AND VERY INTERESTING. IF YOU HAVE A LITTLE GEOLOGY BACKGROUND YOU ENJOY IT EVEN MORE. I'm a big fan of Winchester, but must admit this one was a little dry. Of course I'm not a geologist. However, the story was well told but I found it hard to get excited about the history. What I liked best about this book is a look at the times, society and politics of London, and the various organizations involved with furthering knowledge of the time. I think those that like this book would also like "Into Africa", the Stanely and Livingston story, by Martin Dugard. Maybe I shouldn't have expected that much from a book about the birth of geology, but this one was brutal! I kept waiting for a discussion about how his map changed the world outside of geology, but it never happened. This is what Simon Winchester does best, biographies of people who's remarkable stories have been forgotten. I'm always willing to go anywhere Winchester takes me- this time it's to his home, England. Winchester's reading is always full of vitality and good humor but here his voice actually catches with emotion as he describes the land William Smith first mapped so accurately. There is so much heart in this book that even dry geologic data is transformed into a fascinating narrative. And, as always, the author's intelligence glows in every carefully checked detail. William Smith is the father of modern geology- who knew. I enjoyed this book, primarily because I am a fan of european history. That said, if I had not already been familiar with the author and his tendency to go into intricate detail, I would have found this book a little slow. He does go in depth into the geology of England, and quite frankly it can be difficult to visualize what he tries to describe. But, the story itself is quite interesting so if you can look past the sometimes tedious details, there's a great story here. I like Simon Winchester's books, so I'm somewhat bias. These books take one small topic, in this case William Smith, and expand upon both the TOPIC and the WORLD into which the event/ideas were introduced. Where else can you find this stuff that's not a boring history lecture. You learn about the formation of the National Geographic Society, Plate Tectonics, and a variety of other topics... all while you see true human nature (which ain't pretty) at work. Not sanitized by hundreds of years of editing and revision, Winchester gives an excellent summary of an excellent mind and some wild luck overcoming traditional British society to actually achieve something remarkable. Loved it.